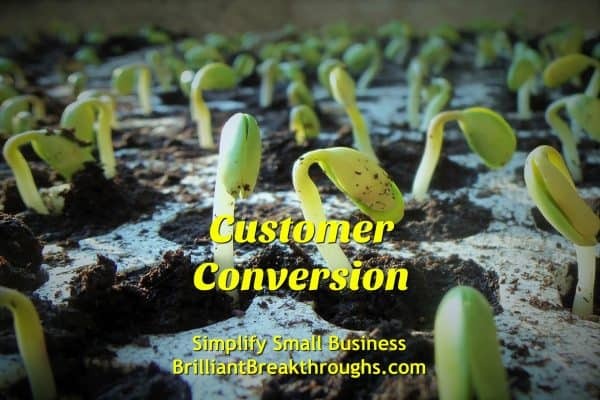 Customer Conversion: Third Small Business Power Move - Brilliant Breakthroughs, Inc.
Do you have a Customer Conversion Process to serve YOUR Customers better? Customer Conversion is a specific and brief moment in time throughout the overall customer experience. Yet, it’s why you’ve been working so hard to complete the first two Small Business Power Moves. This one moment is the key indicator if YOUR Business Performance is on track. Conversion is the precise moment a potential customer makes a purchase from you. In this moment, potential customers become, or convert, to actual customer of yours. It’s when you “make the sale”. That’s it! Click here if you’d like an introduction of all 5 Small Business Power Moves. The first two Power Moves of Customer Attraction and Customer Engagement lead you to this one moment where the magic happens. OK, there’s a simplicity to the definition of Customer Conversion, isn’t there? Sure there is. Why does YOUR Customer Conversion Power Move matter? Some Small Business Owners (SBOs) conduct the entire Customer Attraction, Engagement, and Conversion online. Others do the first 3 Power Moves in person, while others do a combination. Your methodology (approach) doesn’t matter. What matters? That you do a converting moment! You’ve worked had to attract people to you and your awesomeness. You’ve learned how to engaged them in a good way, right? Then why do you hesitate to invite them to convert into your customers so you can serve them? NOTE: A small number of people are engaging with you because they like you. A majority of people are engaging with you because they have a need and are seeking a solution. They want more! Develop it and invite them to it (conversion). Over 5 years ago I had a client who had a great idea to serve the marketplace. We worked to develop it properly to provide solutions to the marketplace’s needs. We developed the products while they were out networking. Great connections were made. Scratch that – phenomenal connections were made! All phases of the product were roughed in. The latter phases weren’t complete until customers went through the first two phases to assure the rest of the program was fulfilling their needs. Ok, did you hear me? The first two phases were open for business at an Introductory Rate that was irresistible. What do you think happened next with all those great connections and conversations? Ready for this – nothing. This client could not flip the switch- no matter what. Everyone was all hot and ready to go, but they were’t ask to purchase the offering. Not one. CAUTION: Not inviting YOUR Potential Customer to purchase from you is the Kiss of Death for YOUR Business. If you aren’t inviting them deeper into YOUR Process, you’re a Surface-Dweller. Click here to learn why Surface-Dwellers aren’t delivering what their customers need. TIP: People will like you much more if you introduce them to YOUR Solutions (offerings) which can help them with their needs. Potential Customers already know their pains and aspirations. You’re talking to them about it through Attraction and Engagement. You are actually doing them a dis-service by not inviting them the next steps to improve their situation. Are you courageously stepping into this Small Business Power Move of Customer Conversion? You’re all about helping people, right? Then help them! Don’t let your personal glitches get in the way of YOUR Customers being serve by you. If you don’t like inviting someone to check out your solutions, change your process to online. You’re doing an invitation – just online. If you don’t know how to do this online, find someone who does and hire them. Caring about YOUR Business and YOUR Customers mean you make them a priority. Don’t hesitate any longer. Everyone wins when you make time to create a successful Customer Experience process. So what’s holding you back? If you need help with this Small Business Power Move or other business performance frustrations, just contact Maggie for a 30 minute conversation – either with a call or this link to discuss the gap between where you’re at and where you’d like YOUR Business to be Performing. Don’t worry, it’s not a sales conversation – don’t bring your credit card because it won’t be accepted! Please feel free to share your insights about the Customer Conversion process in the comment section. p.s. 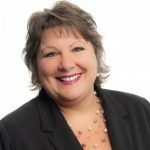 : If you’re in the Milwaukee area on the last Friday of the month, join us at Wisconsin Business Owners Lunch and Learn to learn about and practice client engagement with other Business Owners! I had two conversions this week. About two weeks ago I had a personal meeting with one and a phone conversation with the other. We discussed the details of my packages at the end, and I told each I would send an email with all the package details. They both purchased my mid-priced package. Once I get people to talk or meet with me the conversation rate is high. They need my services and buy! FYI Maggie is my business coach! Feeling very grateful Maggie. Thank you! I couldn’t have done this without you! Stacy, you deserve the rewards for having a high conversion rate because of how we worked to craft how to communicate effectively to YOUR Ideal Customer and what offerings to provide them. All that work is paying off wonderfully for you now! Thank you for the kind words. I know this journey wasn’t always easy, but we sure simplified your success! I can hardly wait to have you do all my business photos 🙂 Keep rockin’ it!